Itchy Dogs Need Fast Relief. Try Wham Anti-Itch Spray. This spray is a must for any dog that suffers from itchy skin! It can be used in conjunction with all our shampoos, either for in-between baths or for stopping those really stubborn itches....immediately! 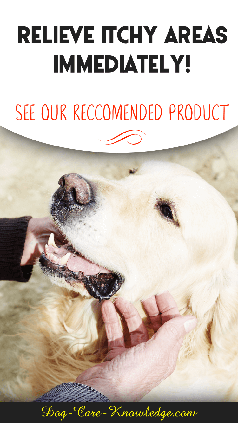 It is an antimicrobial and anti-fungal medicated spray that helps relieve problems associated with a variety of skin irritations such as hot spots, yeast, dry flaky skin, seborrhea (dandruff), flea bites or just for those constant chewers. Great product that actually works! This spray stops the itching and has a lovely smell that lasts! My pup had dry and flaky skin due to allergies. I use this on my pup directly after bathing and daily during brushing. I have noticed a significant reduction of itching and my pup smells delightful. seems to instantly stop the scratching! so far so goid! My GSD gets hot spots when he is stressed. I usually have to shave the area, then put multiple meds on it for several days to weeks and cone him (the cone of shame). But this Wham spray is a total game changer and life saver for both of us! I sprayed this on his spot a few times a day and it was dried up with in a week!! I didn’t have to shave the area or cone him!! The spray is so soothing to him he didn’t bother the spot as long as i kept it sprayed a few times daily. He also has itchy skin so I just fluffed his hair and sprayed in on his skin and it helped him be less itchy. I also use the derma-dyne shampoo, and that has helped his itchyness in the biggest way possible! Our dog had a large spot scratched open on her neck. I had been rubbing Neosporin on the spot & it seemed to get better before I got the Wham. When I got it we used it right away & I think it did look better the next day. After almost a week it is still slightly red but not scratched open. In this review, I can only say that I was satisfied with the results that I received from the combinations. I did not use any one product by itself. I have a mini dachshund and she was having dry skin issues, so I went through the list of what could have been the cause and bought the three that I believed to be the best options. I have bought shampoo from the vet I take my dog to and it only made her itch more and had no positive results. I bought another shampoo later and had no good results, so I came across this website on Google. I used the products three days ago, saw immediate results, and I am still satisfied, but cannot comment if the results will last the rest of the month. I do expect the products to have better results in 27 days when her next bath is scheduled. I was surprised that the results seen were only from spending $45.00. I skipped a vet visit due to these products. She fell asleep early after her bath and she slept better than she has the last two or three months. I have not tried to do the hot oil like-option yet, but plan to. Works great on my little wienie dog's itchy skin and has a pleasant smell. One thing, if your dog has allergies like mine, one application probably won't last all day. I have to spray him in the morning and also later in the day, but it does stop him from itching and scratching. Click the button below to add the Wham Anti-Itch Spray to your wish list.